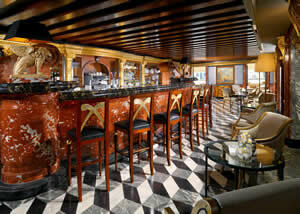 The Europa & Regina is the Dowager Duchess of the hotels on the Grand Canal. And anyone with any sense loves Dowager Duchesses. She might be a tiny bit faded nowadays, but she remains as charming and as refined as you could possibly wish. Her public rooms are swathed in acres of coloured marbles and those fortunate persons who linger within them have the choice of ancient sofas and inviting fauteuils in which to sprawl with languid elegance. Five palaces from the 18th and 19th Centuries have gone to make up this attractive place. The oldest originally belonged to the Tiepolo family. This became the Hotel Barbesi in 1868, and then the Britannia in 1881 – in which guise it attracted the custom of the painter Claude Monet. In 1938 its name expanded to the Europa & Britannia, and then in 1976 it merged with the Regina next door to reach its final appellation: the Europa & Regina. 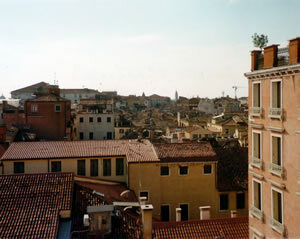 Inevitably, in Venice, you pay for the view. And the Europa & Regina has one of the best: straight across the water to the soaring domes and swirling buttresses of the Church of Santa Maria della Salute. 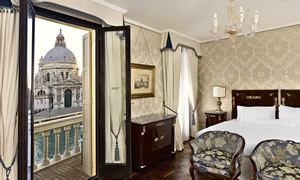 If you are new to La Serenissima, you will want one of the rooms which face this masterpiece. But I have visited the city many times, and for me space takes precedence over the view. At this point I should introduce you to a splendid fellow, Luca Casarin (pictured). His title at the hotel is Shift Leader. (No, I do not know what it means, either.) Luca – I think he will permit me to use his Christian name – is a gem. He went to all sorts of trouble in all sorts of ways to ensure that my stay at the Europa & Regina was thoroughly enjoyable. And his first piece of magic concerned my room. He showed me a billet with the famous panorama. But he could sense that I found its space rather restricted. He therefore whisked me off to the 6th floor to room 620, a ‘Premium Double’. At 1,110€ a night, bed and breakfast for two (but check on the hotel website for the rates for specific dates), this was actually cheaper than the other room. But it was much, much larger – indeed, the bedroom was what I regard as the near-perfect size for an hotel bedroom: 16 feet by 16 feet. 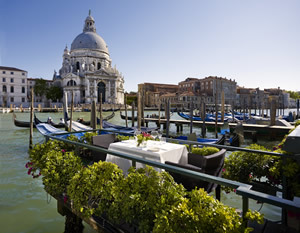 True, the Grand Canal had disappeared, but the view from the four windows – of ancient tiled roofs, church façades and leaning bell towers – was still a delight. This light and airy apartment was exactly what I wanted. There was plenty of space for the sofa in brown velvet, the armchair in blue velvet and the mahogany writing desk. My bed was made – at Luca’s behest, of course – wonderfully soft for me. The lighting from the crystal wall lights and the four table lamps was discreet and restful. Through a door was the dressing room, with fitted wardrobes, a vanity unit and a private safe. Another door opened into the large bathroom, a chamber of spotlights and grey marble. It contained two wash basins, a loo, a bidet, a bath tub of adequate size and toiletries by Etro (including perfumed water). From this fine apartment I went down to dinner in the hotel restaurant, La Cusina. 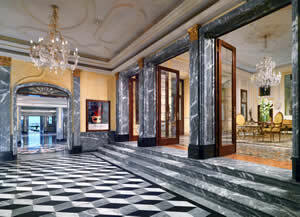 Here I was once more surrounded by lots of marble. Upon my table was yellow napery and good glassware by Schott. And there, through the window, as I settled into the supportive armchair, was the famous view. Maitre d’ Vicenzo Nigri is friendly, hard-working and efficient. I certainly liked the way he ensured that my evening proceeded smoothly. By chance, I happened upon an event called, “Gusto In Scena”, at which the Chef at the Europa & Regina, Alberto Fol, was joined by Chef Peter Cheung Chi Fung, from Le Royal Meridien Shanghai, to produce a ‘four-handed menu’. From this I enjoyed best the openers, which were full of interesting tastes and textures: Cantonese roasted duck with pineapple and plum sauce, honey-flavoured nuts with sesame seeds and Sorano beef tartar with Fossa cheese. The wine list has 166 offerings, all Italian except the champagnes. Prices run from 40€ for various bottles, like a Sicilian chardonnay by Cusumano, to 800€ for Cristal rosé champagne. 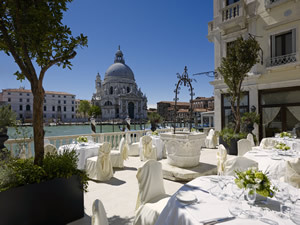 There is a ‘super-Venetian’ section, including 2000 Amarone, Quintarelli (610€). Other bottles to catch my eye were: 2010 Planeta chardonnay (80€), 2009 Cervara della Sala, Antinori (90€), 2009 Tignanello (190€), 2009 Ornellaia (500€), 2008 Solaia (510€) and 2009 Sassicaia (510€). I returned to the restaurant each morning for breakfast, and secured a variety of comestibles from the extensive buffet. Particularly good were the croissants and the dishes of pineapple, orange, melon and kiwi. Brought to my table were pots of coffee, my concluding cappuccini and my specially cooked tomato omelettes. I commend the Hotel Westin Europa & Regina to you. 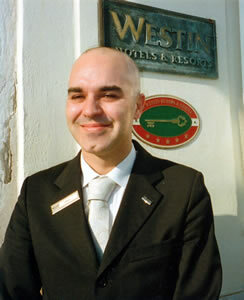 You will enjoy your stay, for the hospitality within her walls is full of grace and charm. That, after all, is what you expect from a Dowager Duchess. San Marco 2159, 30124 Venice, Italy.